Tonight and Tomorrow: The showers and storms that moved through the area earlier in the afternoon are now starting to turn spotty and halt as we head through the evening hours. Drier conditions will take hold by 9PM, and cloud cover will also break up as we approach midnight. If you are out late tonight, and under clear skies, look up toward the northeast. You could see a shooting star associated with the Perseid meteor shower, which will peak over the next three nights. Overnight lows will drop to near 73°, with calming winds. Partly cloudy skies to start your Sunday morning, with a potential for some light showers along the coast. Much like the last several days, that moisture will move further inland through the afternoon to provide scattered showers and an isolated storm or two until 8PM. High temperatures will reach around 91° early in the afternoon, before showers help to cool conditions down a bit. Up Next: An upper level ridge will build from the south late Sunday and early Monday, helping to limit afternoon showers and storms through the beginning of the workweek. This lack of cooling showers will help to increase high temperatures into the above average range, peaking Tuesday and Wednesday in the mid-90s. There will still be some moisture in the atmosphere, so heat index values will likely make temperatures feel like they are in the triple digits. A disorganized area of showers and thunderstorms is located about midway between Africa and the Lesser Antilles. Some slight development of this disturbance is possible during the next day or two while it remains nearly stationary. 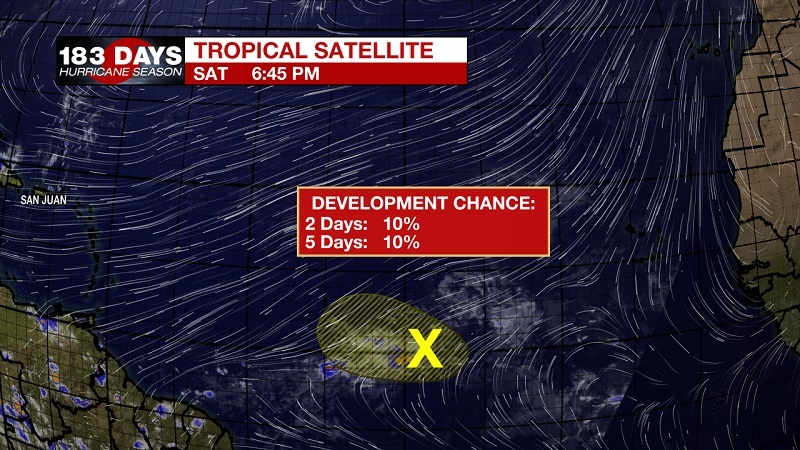 The National Hurricane Center is suggesting a low chance of development at only 10% over the next 5 days. The upper level trough dipping south across the Front Range of the Rockies is starting to lose it strength and beginning to lift. 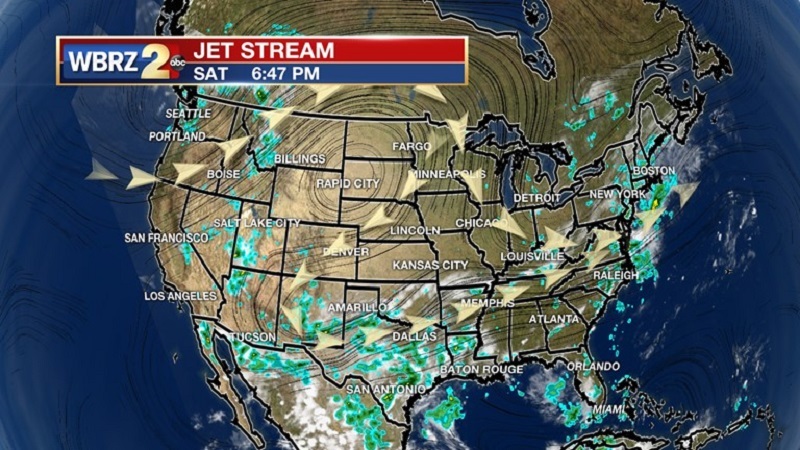 This trough is responsible for helping the high pressure in the Gulf of Mexico in spewing moisture onshore in the Gulf Coast and across and into the East Coast. 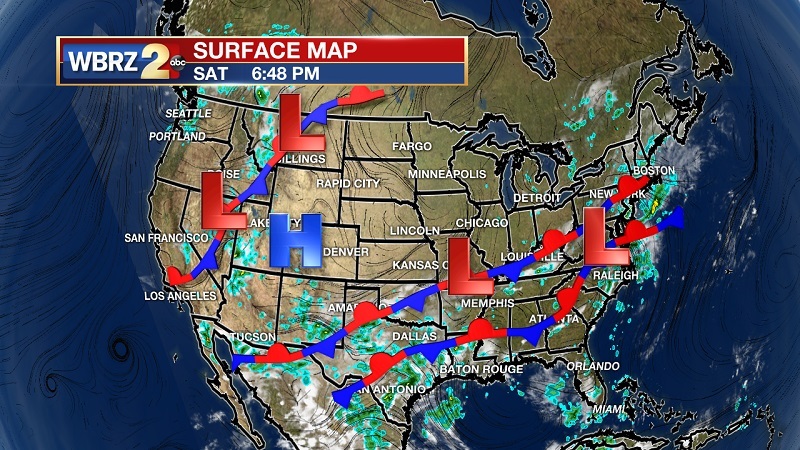 This lifting of the trough will result in drier conditions and warming temperatures through Wednesday. Dewpoint temperatures will also slightly decrease into the low 70s during this period, which will still allow for heat index values to reach above 100° through Thursday. Temperatures begin to drop as the ridge starts to break up later in the week, which will also increase afternoon storm chances as we proceed into next weekend.